14 of the greatest standards ever written now in keys specifically designed for singers. 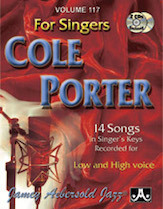 Includes a book and 2 CDs - one CD for high voice and the other CD for low voice - so all singers, men and women, can find a key comfortable for their personal range. The book includes all of the songs written in both keys with lyrics clearly notated over the melody line.